On Saturday April 8, students from the FHS Music Department departed for PSU to participate in the KSHSAA Regional Solo/Small Ensemble Festival-Contest. Students participated in both instrumental and vocal events. Frontenac walked away with 22 students qualifying for the KSHSAA State Solo/Small Ensemble Festival-Contest to be held at Chapman High School on April 29. Those who qualified to go to state are: Madison Short (Vocal Solo), Kiera Threlfall (Vocal Solo), Ross Fry (Vocal Solo), Sean Hagerty (Snare Solo) and the Percussion Ensemble (Bralyn Wilson, Kieran Wilson, Sean Hagerty, Ross Fry, Conner Hastings, Zach Troth, Korbin Marshall, Logan LeGrand, Dakota Lapping, Madison Short, Madison Blakemore, Meranda Belew, Kiera Threlfall, Tucker Jessip, Chase Martin, Jermiah Mellnick, Hanna Switz, MacKenzie Hensley, Chase Blakemore, Kennedy Allen, Easton King). 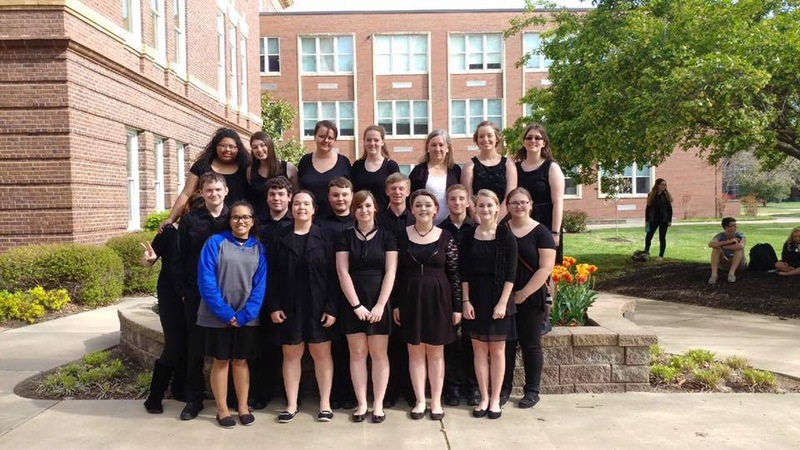 Other students who participated were: Autumn Bryant (Vocal Solo), Meranda Belew (Alto Sax Solo), Korbin Marshall (Bari Sax Solo), Madison Blakemore (Flute Solo), Bralyn Wilson (Flute Solo), Kieran Wilson (Clarinet Solo), Ross Fry (Snare Solo), MacKenzie Hensley (Bass Clarinet Solo), Women’s Choir (Kiera Threlfall, August Chamberlain, Ashlee Morey, Mavia Lee, Autumn Bryant, McKenzie DeMott, Madison Blakemore, Madison Short), and Mixed Choir (Kiera Threlfall, August Chamberlain, Ashlee Morey, Mavia Lee, Autumn Bryant, McKenzie DeMott, Madison Blakemore, Madison Short, Austin Souder, Buddy Lee, Chase Martin, Tucker Jessip).